Here's a card I made using the Bingo Card Set from The Cutting Cafe'. You know I'm addicted to pattern paper and I needed to incorporate it somehow in my card. So I took a piece of old K&Co. valentine paper that I had in my stash, cut it down to 8-1/2 x 11 and printed out the Bingo Card. 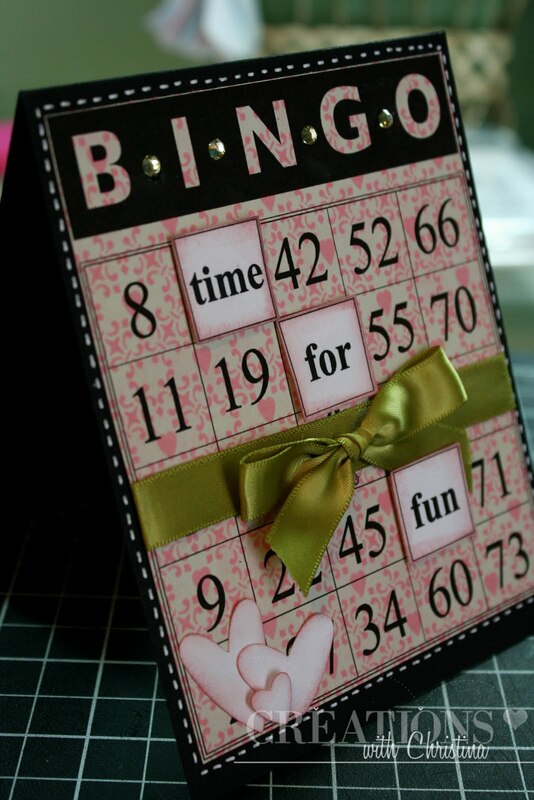 The bingo card fits perfectly on a standard A2 size card. Love the BINGO card! I will have to get this image set. My mother loves BINGO. Wow Christina! You did it again. An AMAZING card. I don't have any bingo stuff in my collection. I would like to know more. How do you print it? Is it softward? Absolutely adorable!! Reminds me of something! You'll see! This is a really cute card, love the soft colours you used on it. That is an adorable card. My Mother loved Bingo. The Cutting Cafe has so many nice things. I'm going to have to buy that Bingo set. Simple and effective. Great style. I love your card Christina! I have a bingo card and wondered how I could use it thanks for the great idea. Love this card Christina, the stitching just makes it pop and what a great new tool. So cute, Christina. Love the new schedule for the blog. Thanks!